Wilson Cellular Interior Dome Amplifier Input Antenna. 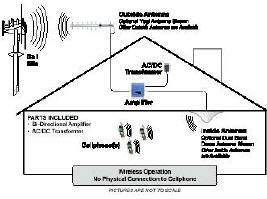 This picks up your cell phone signal and transfers it to the wireless amplifier. For neat looking home or office installations. This antenna mounts to the ceiling similar to a smoke detector. Low prices and fast shipping.